NASA’s decade-old Mars rover, Opportunity, has found new evidence that life-friendly fresh water once pooled on the red planet’s surface, reinforcing similar discoveries made by newcomer Curiosity on the other side of the planet, scientists said Thursday. Opportunity and its twin rover, Spirit, landed on Mars 10 years ago, both looking for clues of the past existence of water. Both rovers confirmed evidence collected by orbiting spacecraft that Mars, the planet believed to be most like Earth in the solar system, was not always the cold, dry desert that appears today. A new study published in the journal Science bolsters that evidence, showing the earliest signs of water yet among rocks from the Endeavor Crater, where Opportunity has been exploring. The Endeavor rocks are about 4 billion years old — the oldest the rover has found — and contain telltale clays that form in the presence of water. What’s more, the chemical makeup at this site is far less acidic and salty than at previous sites, meaning that it would have been more hospitable to living organisms. The finding adds to an emerging picture of a planet that spent its first billion years or so warmer than it is today, with pools of fresh water on its surface, scientists say. Early discoveries by the Curiosity and Opportunity rovers pointed to a planet that was once tropical and moist. Gradually, water activity declined and what did exist became acidic, scientific findings reveal. About 3 billion years ago, Mars dried up, becoming an environment that would have been too harsh to support microbes. More recently, Opportunity uncovered geologic evidence of water at Endeavor Crater that’s more suited for drinking — a boon for scientists searching for extraterrestrial places where primitive life could have thrived. Opportunity made waves earlier this month when it discovered a rock shaped like a jelly doughnut that suddenly appeared in its field of view, probably after its wheel kicked it up. 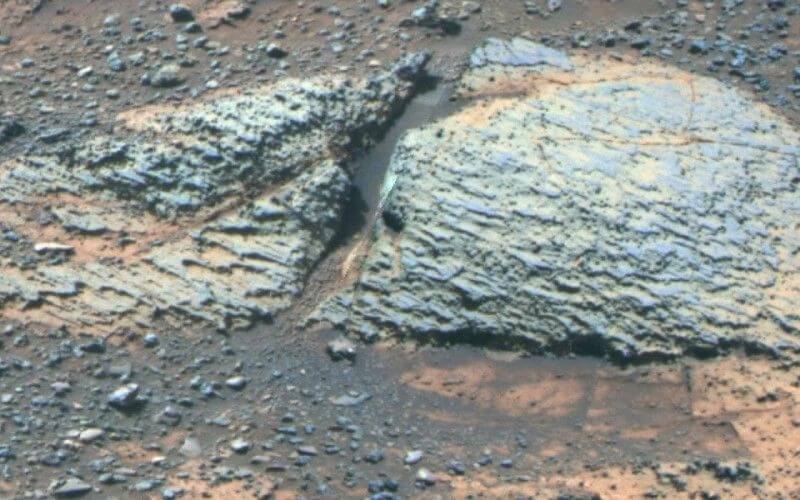 Scientists said it’s unlike any rock they’ve seen on Mars before. Opportunity is expected eventually to head south toward a ridge on the rim of Endeavour Crater that appears to contain a much richer cache of clay-bearing rocks. “As long as the rover keeps going, we’ll keep going,” chief scientist Steve Squyres of Cornell University told The Associated Press.